^ Columbia Center. The Skyscraper Center. Council on Tall Buildings and Urban Habitat. （原始内容存档于2013-12-01）. ^ 5.0 5.1 Susan Phinney. Chester Lindsey dead at 76: Architect changed look of Seattle's skyline. Seattle Post-Intelligencer. August 18, 2003. ^ 6.0 6.1 Bank of America Tower (formerly Columbia Seafirst Tower). Howard S. Wright. [June 13, 2012]. （原始内容存档于2016年1月16日）. ^ Terry Finn. Building towers over Seattle. Anchorage Daily News. UPI. May 3, 1984. ^ 8.0 8.1 Timothy Egan. Creating An Office Empire. The New York Times. June 29, 1986. ^ Tom Boyer. Region's loftiest building renamed. Seattle Times. November 22, 2005. ^ U.S. Steel Move Draws Fire. AP. February 26, 1983. ^ Bill Dietrich. Selig Undaunted After Selling His Seattle Skyscraper. Los Angeles Times. November 20, 1989. ^ Harriet King. Project Tailored To Space Limits. The New York Times. November 26, 1989. ^ Height plan reduced on Seattle towers. UPI. August 7, 1984. ^ Robert T. Nelson. Tallest Building To Reach Higher -- City Issues Permit For Seafirst Antennas. Seattle Times. January 5, 1990. 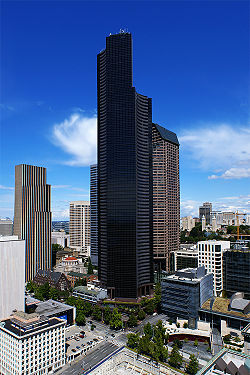 ^ Taller antennas sought for Columbia Center. Puget Sound Business Journal. August 6, 1999. ^ Andrea James. Interested in share of 76-story tower?. Seattle Post-Intelligencer. October 13, 2006. ^ Amy Martinez. Pension fund puts stake in Columbia Center up for sale. Seattle Times. October 13, 2006. ^ Jillian Ambroz. EOP Pares Portfolio Before Sale To Blackstone. CoStar. January 9, 2007. ^ Kiran Umapathy. Blackstone Completes Seattle Sale to Beacon. CoStar. May 2, 2007. ^ Eric Pryne. Columbia Center misses mortgage payment. Seattle Times. March 24, 2010. ^ Current Portfolio. Beacon Capital Partners. [June 12, 2012]. （原始内容存档于2012年10月22日）. ^ Outline of the 9-11 Plot, Staff Statement No. 16, (PDF). National Commission on Terrorist Attacks: 13. 16 June 2004 [10 June 2012].